There's been a lot of flap in the media saying that Ken Salazar, Secretary of the Interior in the Obama administration, has announced this week that Atlantic offshore wind power could "replace coal" as an energy source for America. Well, that's not exactly what he was saying. He was saying that in theory, the DOE has identified 1 million megawatts of potential wind power off the Atlantic coast and that this is five times the power generated by the coal industry. He was trying to draw attention to the enormous resource, not actually claim we could harvest 100% of the resource. Here in Minnesota we're not a coastal state but we do have a lot of wind power located here. Minnesota is ranked 4th in wind power in the US. That number keeps changing from year to year as states build more and more wind generating capacity. The associated press coverage of Salazar's comments is most interesting because of the smattering of comments from folks who are pro-fossil fuels. As suspected, saying that we can get rid of our dependence on Coal (even if was just to illustrate a point about the potential of wind) has the coal industry in a panic. Even the oil industry is worried about a shot across the bow of a fellow fossil fuel. From the AP article, "Skip Hobbs, a petroleum geologist from New Canaan, Conn., said oil and gas drilling has been shown to be safe." Apparently this comment was to show that we don't need wind power, never mind that his argument is a complete red herring but come on Skip, you're going to play the safety card? How about Helicopter Crashes, Rigs crashing into platforms and killing workers, Oil rigs sinking into the sea spilling fuel, and oil spills? How about we ask the families of the 167 people who died when Occidental Petroleum's Piper Alpha offshore production platform exploded how safe they think the industry is? Dependence on non-renewable fossil fuels and global warming are the real issues here but Skip must not want to get into a discussion about those. A bit of free advice, if you're going to play a red herring make sure it's at least a good one. American Coal Council spokesman Jason Hayes put forward what on the surface appear to be real concerns. He said wind power plants, "face roadblocks including local opposition, concerns about their impact on wildlife, and problems in efficiently transmitting power from far offshore." Pot calling the kettle black anyone? Wind farms certainly face local opposition but so do coal plants. Who is Jason Hayes to criticize? Do you know anyone (besides Jason Hayes of course) who wants a coal fired power plant in their neighborhood? I'm betting if the choice was a coal plant or a wind farm most people would prefer a wind farm. Concern for wildlife? Has Hayes ever heard of global warming? Coal is enemy number one in this department and global warming has a far larger impact on wildlife than wind turbines. Problems transmitting power from offshore? Certainly something that has to be done, but look how much trouble the Coal industry has had getting coal through Minnesota on something as simple as trains. 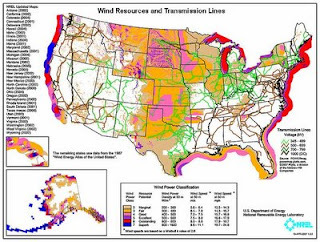 I think people will be a lot more open to underwater transmission lines than they are about having them go over the roof of their houses and through their farms like with a coal plant. The article points out the Salazar's estimate of 1 million megawatts would require a lot of turbines but fails to note that he wasn't saying we should or even could exploit all the the potential that exista. They don't give a number but some quick math says that if we used 10 Megawatt turbines you'd need 100,000 turbines. Of course that's a rediculous number of turbines for the Atlantic coast. His point was that there is the potential for that many and we've built a grand total of zero offshore farms in the United States. So far we've exploited only the marginal land based areas for wind power. Southwestern Minnesota is only rated as "good" for wind power while Lake Superior and the coasts are rated as Excellent to Outstanding. Click the graphic for more info. Salazar's point was that we have an incredible untapped resource that could help us become a greener country. The fossil fuel lobby seems hell bent on keeping that resource untapped. Offshore movable oil drilling platforms? Safe and logical. 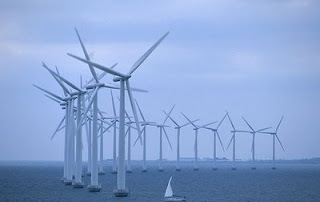 Stationary offshore wind turbine? Preposterous! We've heard this all before.